Flexible type logos are trending, and for good reason; they’re suitable for nearly any media type. 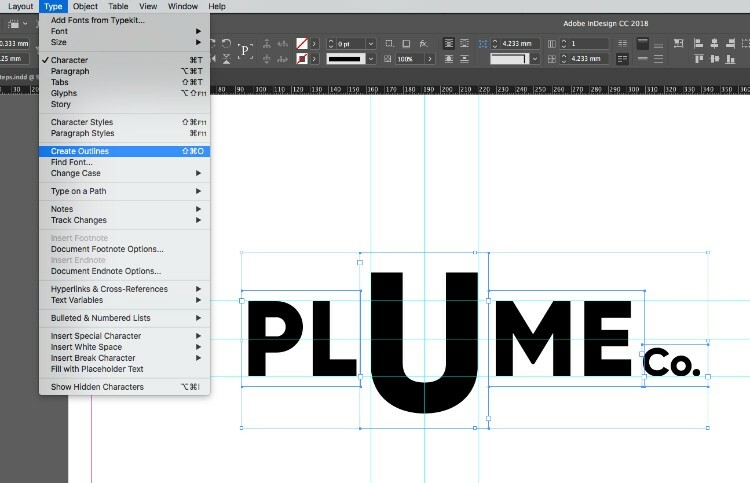 Discover how to use InDesign to create your own unique flexible type logos. Flexible logos that shift position and orientation are big news in graphic design right now. Why is this way of creating logos so effective? For one thing, by creating a flexible logo with multiple positions you can adapt the logo to a wide range of media. Have a tall, narrow exhibition banner? A tall logo that fills the space will always look better than a small-scale square logo. Looking to adapt your logo for an app? A flexible logo gives you more freedom in how that logo can be arranged on different screen sizes. As brands need to adapt to both the print and digital spheres, flexible logos also translate incredibly well to both. This logo trend can look fantastic when adapted to animation, for example. Here we’ll look at some top tips for creating flexible type logos using Adobe InDesign, from how to choose a core for your logo to how to structure your typography effectively and professionally. You can use any typeface style to create your flexible logo. Many professional design agencies will use either bespoke or adapted typefaces to ensure their logos are completely unique. However, it’s also easy and effective to use a pre-existing font. You can find great paid-for fonts on font sites like MyFonts, or check out Font Squirrel for free commercially licensed fonts. You can also find a wide range of vector fonts on the Shutterstock library. Sans-serif fonts in heavy weights tend to work well for flexible logo designs, as they’re clear, easy-to-read, and have a clean, modern look. But, you could also give a more traditional serif font a contemporary twist by using it in a flexible logo. Open up InDesign, and go to File > New > Document. You can create your logo design on any page size, but it helps to have plenty of room to play around with. Here, I’m working on a Landscape A3 page. Once you’ve decided on your page size, click Create. Use the Type Tool (T) to create a text frame on the page, and type up the name of the brand. Copy and Paste the frame a few times, and position each under the previous in a vertical sequence. This will allow you to easily compare fonts. From either the top Controls panel or the Character panel (Window > Type & Tables > Character), set the Font of each text frame to something different. Get experimental and play around with different type styles. You’re looking for a font which has the right mood for the brand, but also is clear, legible, and noticeable. Here I’m experimenting, from top to bottom, with Orkney, Gilroy, and Spartan MB. Narrow your choice to one font. I’ve decided to use Gilroy, which in the ExtraBold weight has a really pleasing appearance, and looks friendly, modern, and is really easy to read. Its chunkiness will also ensure the logo will stand out when viewed from a distance. A flexible logo is not a series of different logo designs, but rather a series of variations of the same logo design. To ensure your logo design has obvious continuity between different versions, a good tip is to choose a core letter for your logo. This is the letter that stays roughly in the same position, while other parts of the logo orbit around it. Identify the letter or pair of letters that can function as a good anchor for your logo designs. This might be the first letter, or last. In this case, I’m going to go for the “U” in “PLUME,” which is at the center of the main brand name. I can reduce the size of “Co.” and use it as an outlying element in the design. Once you’ve identified your core, set this letter in its own text frame on a new page. Click on the Create New Page button in the Pages panel [Window > Pages]. With the core letter positioned roughly in the center of the page, drag guides out from the rulers (View > Show Rulers) to mark out the vertical and horizontal center points of the letter. Drag more guides out to mark out the left and right edges of the letter, as well as the top and bottom edges. Apply the same Font, and make the Font Size smaller. Use the horizontal center point guide to position the text centrally next to the core letter. Use guides to mark out the top and bottom edge of the smaller letters. Select the small letters’ text frame and Edit > Copy, Edit > Paste, and move this copy over to the other side of the core letter. Edit the text inside to read the remaining letters in the brand name. Using the guides you’ve just created, line up this text frame so that it matches the central alignment of the frame on the other side. If you have any other parts to the brand name, such as “Co.” here, set this in its own text frame and reduce the Font Size even more. Ensure the baseline of the text in this frame matches the baseline of the adjacent text frame. With your base logo design created and your guides set up, you can start to get creative with alternate versions of your logo. In the Pages panel, Right-Click > Duplicate Spread on the page which contains your base logo design. Working on the copy of the page, experiment with shifting the text frames around the core, moving them into different positions. You can also experiment with rotating text frames to give a different, jaunty look to the logo. On the text frame, Right-Click > Transform > Rotate… to shift the orientation. Keep duplicating pages, and experimenting with different logo versions. Try creating logos that are more square in shape, and others that are longer or taller. Always use the guides to keep the position of your text frames in check. When you’ve finished a variety of logo designs, you will need to vectorize your logos. This will make them scaleable and easy to use in other designs. Start with your first logo design. Select all the text frames making up the logo and head up to Type > Create Outlines. You can repeat the process for the other logo designs. You can then either Copy and Paste each vectorized logo into other InDesign documents or other software (such as a vector program like Illustrator) to create more designs. Or you can File > Export your logos as .EPS or .PNG files, ready for using in other designs or uploading to a website or app. With your logo designs vectorized, you’re ready to start incorporating them into other designs. Try experimenting with different color combinations. Or, why not create a simple animation of your designs by creating a GIF? Access millions of Shutterstock assets without leaving your Adobe applications. Grace is a graphic designer and design writer from the UK, based in Bordeaux, France. She's a self-confessed 'print geek' and loves all things InDesign, print design, and branding. She shares her experience in the design industry via blogs and her e-teaching business, InDesignSkills.com.